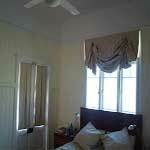 Window treatments can make or break a room. Windows for the most part are often times what frames the room. Deciding on just the right colors, textures and length for the window treatments depends on the color palate and style of the room. 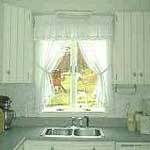 The window treatment patterns found here include kitchen curtains, lace curtains, roman shades, tab curtains and lots more. 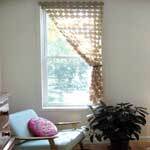 Sewing your own window treatments can save you a lot of money and will give you the feeling of accomplishment. 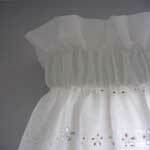 Make these easy to sew charming ruffled curtains that will brighten any room in the house. Here is a simple pattern for a window topper that looks great in a kitchen, bathroom or most any room of the house. 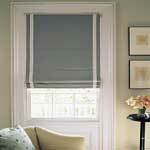 Roman shades create a clean and contemporary style to a room. 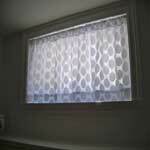 Make roman shades with this window treatment pattern. 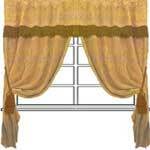 Easy sewing pattern for making attractive drapes to fit a corner window. Here is a detailed curtain pattern to help you make simple lightweight curtains that you can embellish as you choose. This pattern is for a curtain that is designed to fit over a door with a glass inset. Curtain is secured on top and bottom. Make windows come alive with charming pocketed window toppers. 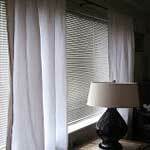 Learn how to sew a box pleat using this easy window treatment pattern with pictures. 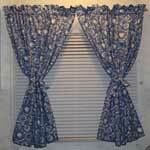 Lined drapes can be very expensive, so why not save money by making your own using this detailed pattern. Here is a video that will show you how to make a curtain for little money and in a short amount of time. 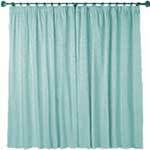 This curtain pattern has detailed instructions with video and pictures for good-looking lined curtains. This pattern is for kitchen curtains that can be made to match your kitchen decor with the right colors and prints. Start cutting out circles for a really cool window treatment. Great for a teen’s room or anyone who is young and hip at heart. 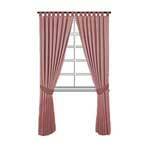 Make these elegant pinch pleated drapes with lining that will frame any window beautifully. 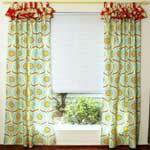 Adorn your windows with lined curtains that look professionally made using this pattern. 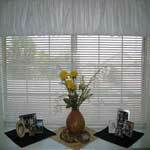 You too can make great looking window treatments with this pattern with illustrative photos. 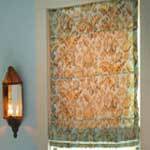 Roman shades work great as a window treatment as they do not hide the window's wooden trim. Here is a great pattern for creating charming balloon curtains for your home. 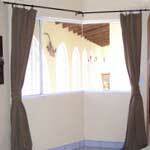 Tab curtains are extremely easy to make and they look good in any room of the house. 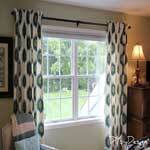 Here is a simple pattern for sewing tab curtains. 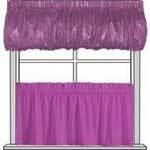 The valance gives shape and added style to a window. This pattern is for a lovely curtain with the valance sewn in. Great for a formal or everyday room. 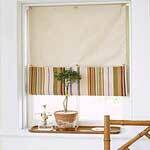 When looking for window treatments for the kitchen or bathroom unlined curtains are the way to go. Unlined curtains can withstand humidity and are easy to take down and wash.
A hourglass curtain works great for covering a long window like you find in a door. Even with limited sewing experience this curtain is a cinch to make. This pattern uses bonding web instead of needle and thread. 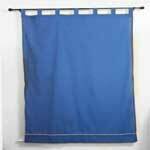 If sewing is out of the question why not consider this simple method for making a curtain. 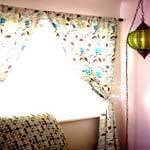 Bring charm and the feeling of home to your kitchen by placing pretty cottage curtains on the windows. Beautiful shades that button up from the bottom can easily be sewn just by following this sewing pattern. 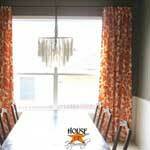 These curtains look great in a kitchen but can go in any room. 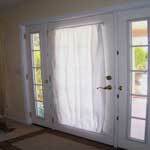 Adding lining to a curtain extends the life of the curtain & looks fuller. You can add style to any room with these easy to make curtains and knobs. 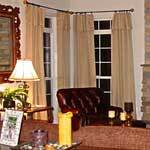 Use a scarf valance alone to frame a window or with blinds and curtains for a layered look. 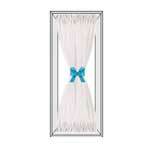 Use curtain tie backs to help expose the beauty of your windows and let the outside in. Here's how to sew simple curtains.